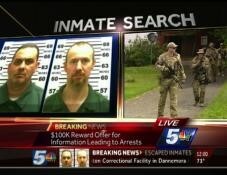 Local TV Covers Hunt for Escaped Convicts | Broadcast Public Service: Local Stations. Big Impact. Former CBS Radio President Dan Mason established the Dan Mason Family Audio Scholarship at Syracuse University’s S.I. Newhouse School of Public Communications to provide financial assistance to a Newhouse senior majoring in television, radio and film with an audio concentration. The first recipient will be chosen for the 2015-2016 academic year.